Showing all 5 posts in September 2014. Whitestar is before everything a multigaming community that focus on its members and to build long standing friendship beyond games. Our primary goal is and will always be our community. This means that – in the countrary of most guilds - we evolve arround our members interests instead of adapting our community to our gaming ambitions. 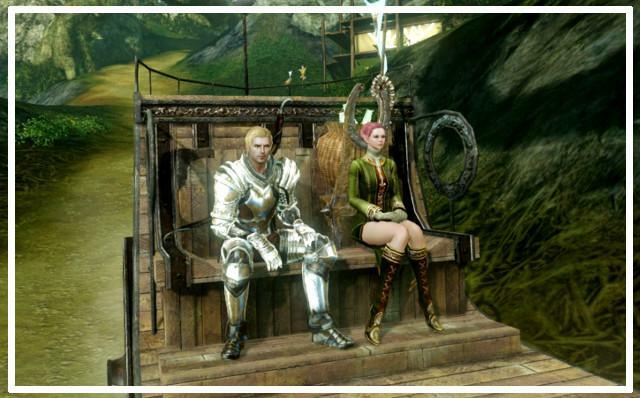 We have just started ArcheAge and we are thrilled to expand our Community in that game. We have no precise goal nor ambition for now. We let ourselves the time to discover the game, learn it and enjoy it . Our guild and our goals will be build step by step as we gather more members. 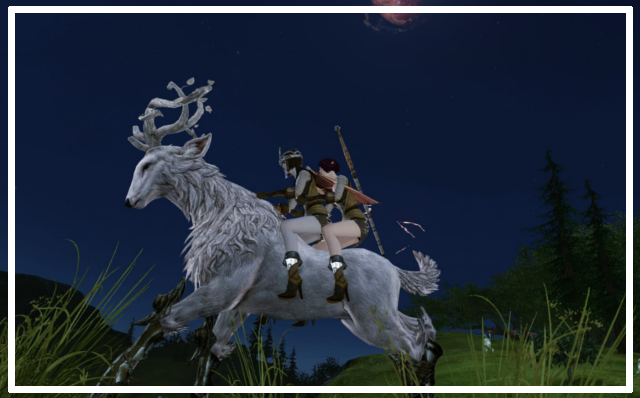 If you want to be part of a new project, a strong and friendly community that stick together accross many games, and being actively contributing to a guild taking shape in ArcheAge, Whitestar may be the right guild for you. 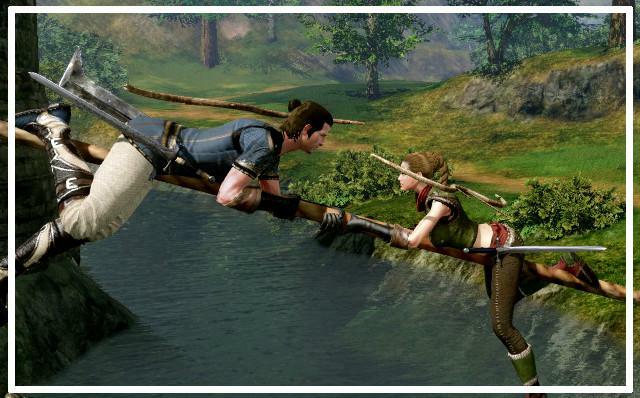 What attracted us in ArcheAge are the endless possibilities of adventures and the fact that there is not a clear path to follow. As ArcheAge is a Free to Play game, we have selected it to be our next Community game. Honestly, we have no idea yet where we are going, but we know that we want to explore this game together. Some will level fast. Some will take their time. We are building our guild in this new game, and only future will tell the direction we are taking. We might become prosperous merchants, or exiled pirates! Players that are seaking for a new home where to enjoy games at their own rythm. Players that value the community above anything else. Players that are dynamic, joyful, passionated. We need more Damage Dealers! Everyone wants to heal or tank in Whitestar! This is a rough summary of our first roleplay event. Participated @BlackBriar @santrasa and @Mida The story was very simple, but we had a lot of fun playing it, adventuring in the dungeon, and using all amazing emotes at our disposal. That day, Elloa gathered her friends around some drinks at the Krang Manor. 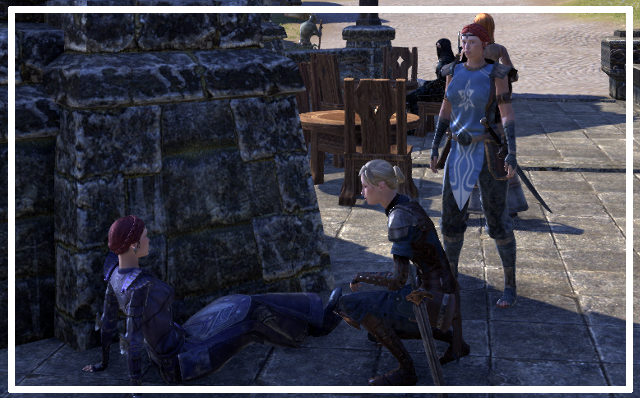 It wasn't the first time they were gathered at the old Manor of Wayrest, but it was the first time Elloa alarmed them with a letter, calling for their help. Maddy, Briar and Frost answered her call, and with patience wait she give them some explanations. Their host, Krang, an old orsimer, adventurer retired, had ask her a favor. The Manor was in pitiful state and he needed help to gather fond to repair it. Willing to help him, Elloa had immediately searched for a solution. She wasn't rich herself, and had not a cent to spare. She asked some guys from the Undaunted guild in the most popular Inn of the Capital, and they suggested her to search for some mines in Deshaan a province of Morrowind: The rumor said an amazing treasure were burred there. The idea of Elloa was to gather her friends and to explore that famous mine. She hoped they would find the treasure and be able to help Krang considerably with the gold found. Maddy, Briar and Frost agreed immediately to join her in her expedition: Elloa had prepared some equipment for their journey: some leather armors, and the weapon she managed to find. The team wearing their new traveling clothes plan their expedition. 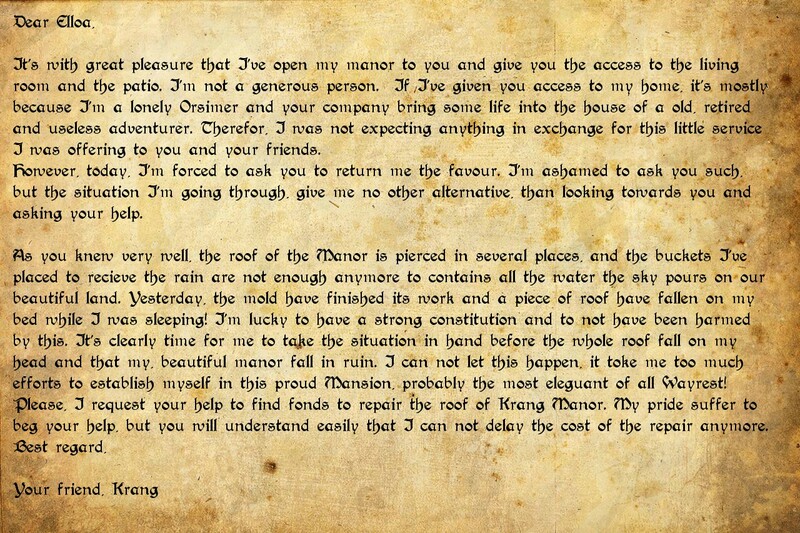 First surprise when they arrived to the Mine, a Dunmer were welcoming them and asking for their help. The Mine was apparently invaded by bandits. The team was fooled, the dunmer revealed to be a Wanted murderer. The money to catch him would replace the unexisting treasure. More surprises were awaiting the team! The Mines opened on Dwemmer ruins, crowded with wild creature and defence automaton. Frost, Maddy, Briar and Elloa approach in silence a giant Golem. It’s time to announce the TeamSpeak winners! We were very happy to see such lovely entries from you. Believe me when I say that it wasn’t easy to pick the winner! To me, everyone is a winner <3 After a lot of blood, sweat and tears, we decided that @itslifejim had the winning entry! Congratulations! The jury found Jim’s entry very original and noted that he probably spent plenty of time on his video. We liked the message (especially the ending, right @Alakina?) and found it generally awesome! The second winner is @Neny, based on the likes her entry got. Congratulations, Neny! You did an awesome job as well! Each participant will get 1p and the winners will get 10p. These points will be added to our seasonal contest’s leaderboard. Thanks to everyone who participated, you have all done a really great job! Take look at the links below to see the awesomeness again! Whitestar is the attempt to create and experiment, within the virtual worlds, an ideal society based on understanding, respect, compassion, friendship. Our main objective is to build a space that feels secure, cozy, joyful and warmhearthed. ESO is a unique game that need another approach than any other MMORPG. 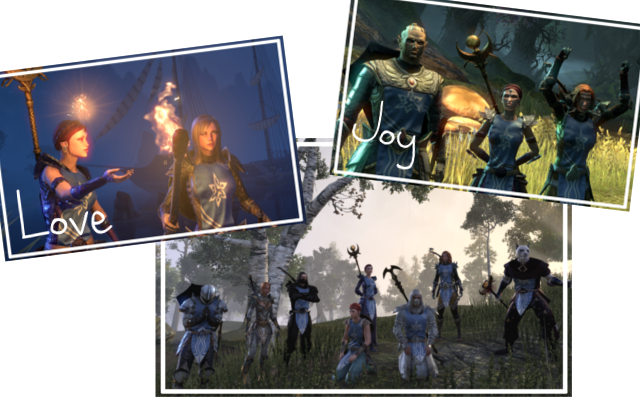 In Whitestar we want offer to our members the possibility of teamplay and a strong social experience, while at the same time, respect the rythm of each of our members and their freedom to play on their own to enjoy the wonderful stories and universe of ESO. Like all our guilds in Whitestar, we pay great care to the atmosphere of our community. In ESO our guild is peaceful, serene and joyful. Our members are mature individuals that enjoy to share some game time together or alone, are helpful towards each others, respectful and warmhearted. It's a stress free environement, ideal for relaxation after a hard day at work. Our members come from every part of the world: from California to Australia, from Finland to Portugal. Most of our members are European though, and our activities are organised in the EU evenings. The age of our members varies from 20 to 60, the majority being 30-40. Our members have different tastes, opinions, style of life, but we share many things in common: our passion for gaming, our passion for The Elder Scrolls, and a nice, warm hearted, respectful attitude. We have realised that most of our member are PVE oriented players. 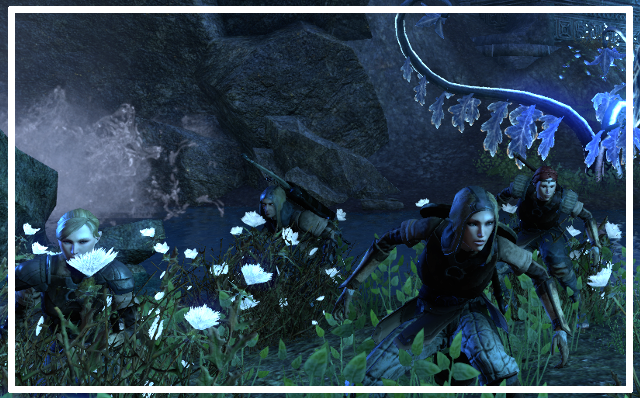 Once we have enough veteran players, we aim to focus our guild activities in Craglorn and Murkmire, and defeat all Trials. While our members are leveling, we organise regular social events (up to three by week), in addition of spontaneous group play. 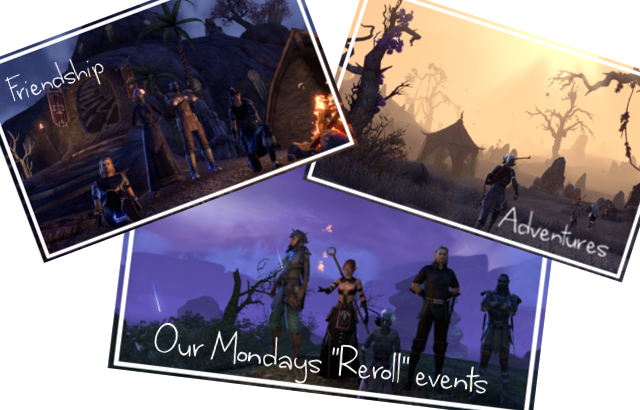 Reroll event in Ebonheart Pact: we have created new characters on the Ebonheart Pact and we level them together every Monday during 2 hours. Purpose is to have fun together, to be social and experience another storyline. A summary of those events are reported in a dedicated thread to allow missing members to catch up for the next event. @PhunkeyMonkeh is also writting a Diary reporting to those events. 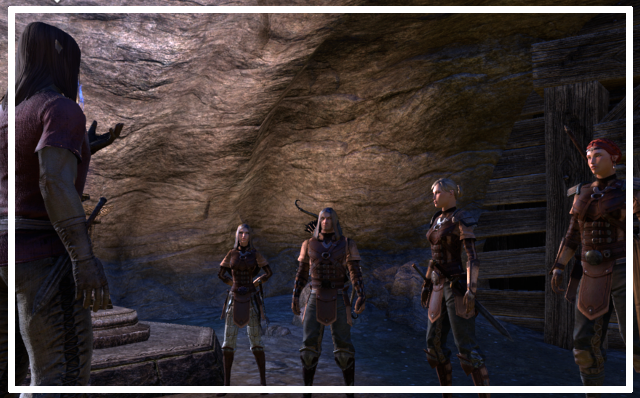 PTS tester Team: We have formed a small group of tester that explores the new content Zenimax is preparing. This allow members of various members to share some moments together with premade characters and experience the most challenging and newest content before it's released on the live servers. In addition, this provide @ZiggsTV and @Elloa a lot of material for their videos serie. 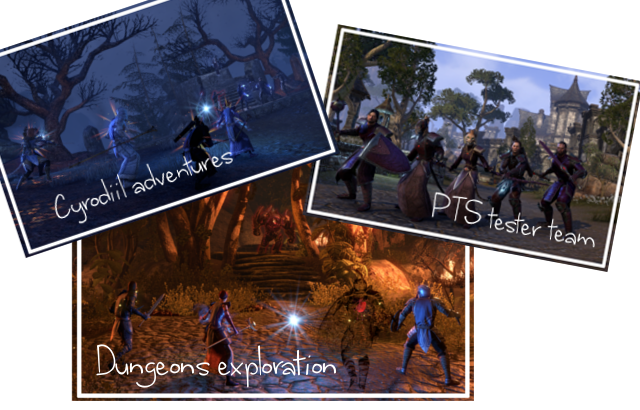 Cyrodiil adventures: We like the possibility of activities Cyrodiil offers for players of various level. 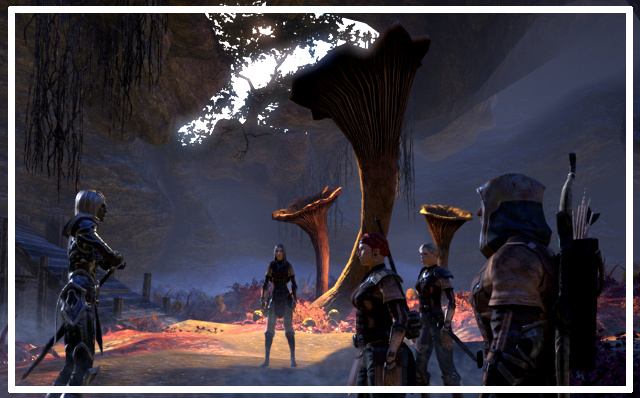 The large areas, the quest, the delves and the occasional PVP encounter offer a great feel of adventure that we can share together with members of various levels. Dungeons run: Those are spontaneously organised by our members when they can. In time, more serious Dungeons run will be organised as our members reach the veteran ranks. Social gathering: sometimes, we simply gather together. It can be to do mini games, like "Hide and Seek" or "Solving puzzles", or some light roleplay. An additional event is organised another day of the week depending the general activity of the Community. 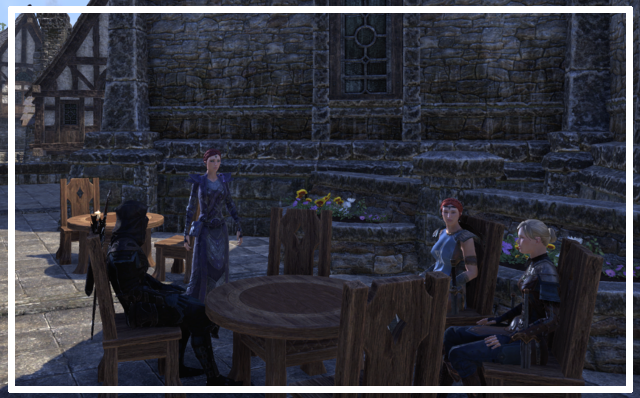 ESO guild is organised and lead by Elloa, assisted by the Officers, which are dedicated, active and trustable members. The feedback and suggestions of all our members is highly encouraged. Alike all our guilds in Whitestar, our guild in ESO is a democracy, and we evolve according to the wishes of our members. Not the other way arround. Guest – Players that have been invited but have not applied on Anook yet. In addition of our guild bank that is used as platform to exchanges materials and items between members, we have two other banks, managed by the officers. 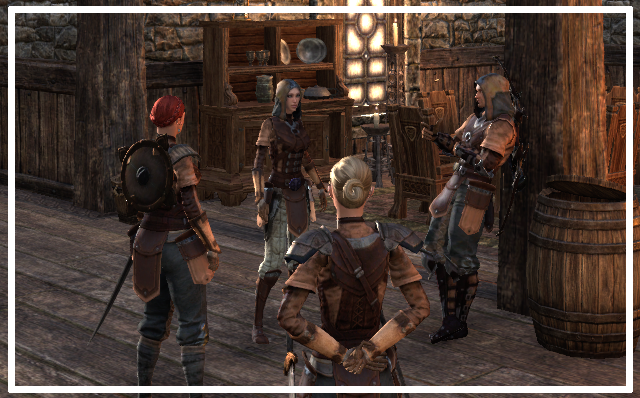 The Ironbank of Whitestar: serve to gather all precious crafting material and piece of gear, to help our members once they reach veteran ranks. Our members are not enforced to join those two additional guilds, but they are accessible to them to help them to improve their crafting, gear and consumables. We do not have a guild store and have no commercial ambition at this day. We exclusively recruit via application on Anook.com We recruit slowly, as we want to leave time to each new member to get properly introduced in our community. We have several recruitment post on fansites and forums, but we do not promote ourselves via the game chat. Sorry its late people. I'll try get them up in a more timely manner. Also it should be noted that these aren't detailed diaries of our activities, just something to add some fun and make it more immersive. For an actual detailed log keep an eye on this thread.